Kitchen : Shrimp Fettuccine : Tasty, easy to make and perfect for a busy schedule! Shrimp Fettuccine : Tasty, easy to make and perfect for a busy schedule! No need to spend all day in the kitchen to make a dish so delicious! 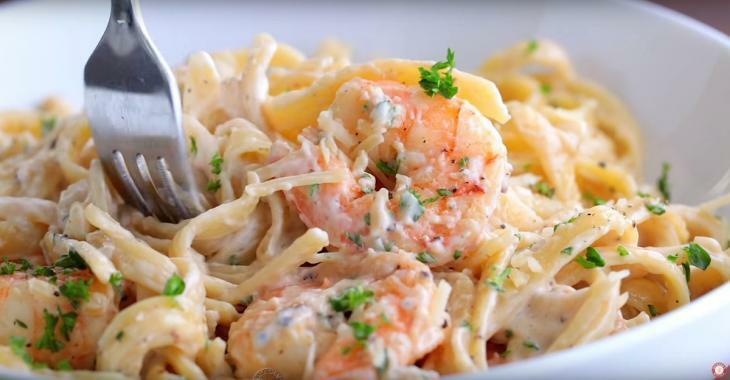 Are you a fan of shrimp pasta? Here's a recipe you should try! Cook pasta as instructed on package. Do not rinse. Season shrimp with salt, pepper and paprika. In a large skillet, heat 1 tablespoon of oil and cook the shrimp 1 to 2 minutes per side. Set aside. In the same skillet, add 2 tsp. butter and cook the onion for a few minutes. Stir in garlic, continue cooking for 1 minute and pour white wine, reduce by scraping the bottom to deglaze. Stir in cream and simmer for 2 minutes. Then sprinkle the parmesan and stir just until creamy and smooth, then remove from the heat. DO NOT BRING TO A BOIL. Add a little bit of paprika and season with salt and pepper. Add cooked shrimp and pasta. Garnish with parsley, basil and Parmesan when serving.